Bowser is up to his old tricks - this time he's raising ghosts to join his evil cause. When he uses these ghosts to take over Yoshi Island, Yoshi sets off to defeat the malicious spirits, and chase Bowser away. Yoshi's Universal Gravitation takes advantage of Nintendo's tilt-sensor technology, making Yoshi move and manipulate certain objects just by tilting the Game Boy Advance. 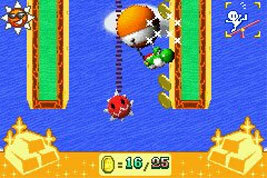 When Yoshi is able to transform into a balloon or a seafaring vessel, you can also help him navigate the often obstacle-laden courses by tilting the game at just the right angle. Of course Yoshi can also perform moves when you use the Control Pad. He can duck and jump, and by eating apples he can lay special eggs that give him new abilities.